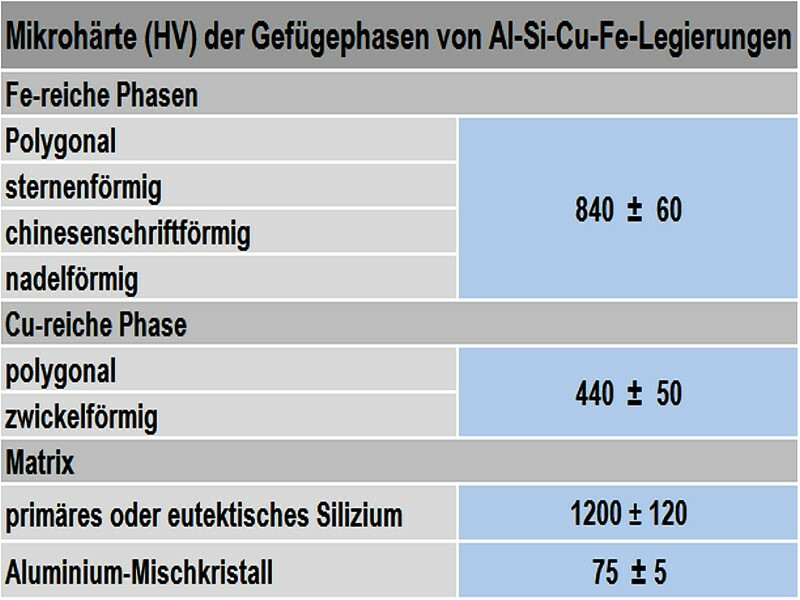 Factor for calculating the segregation behavior in AlSiCu alloys.In aluminum alloys containing iron and manganese, in particular die casting alloys of the type Al-Si-Cu-Fe, insufficient holding temperatures can result in the formation of intermetallic phases of the composition Al(Fe,Mn), Cr)Si which can lead to sludge formation in the furnace.The sludge forming during melting and holding mainly consists of aluminum and magnesium oxides (Al2O3, MgO) and the primary intermetallic phases containing Al, Si, Fe, Mn, Mg and Cr. 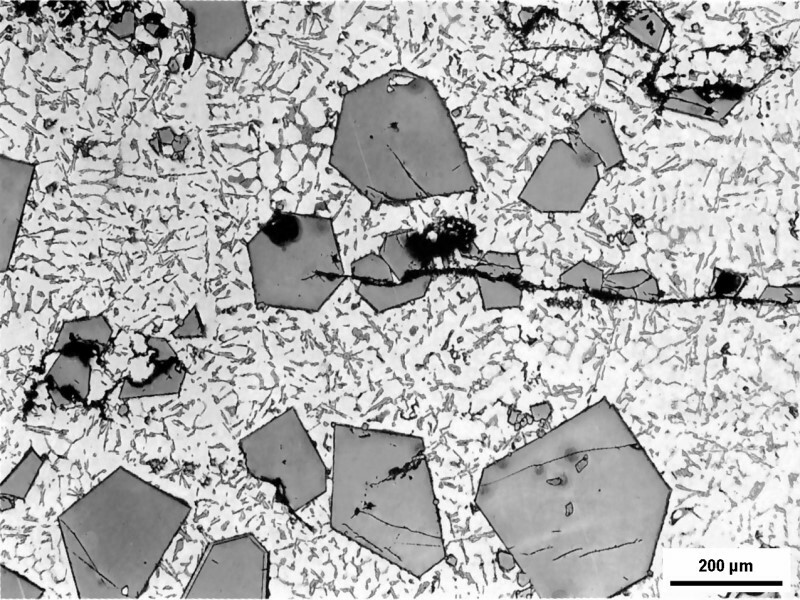 What is especially noticeable in structures marked by the presence of sludge are the large polygonal γ-Al(FeMn)Si phases, as can be seen in Fig. 1. 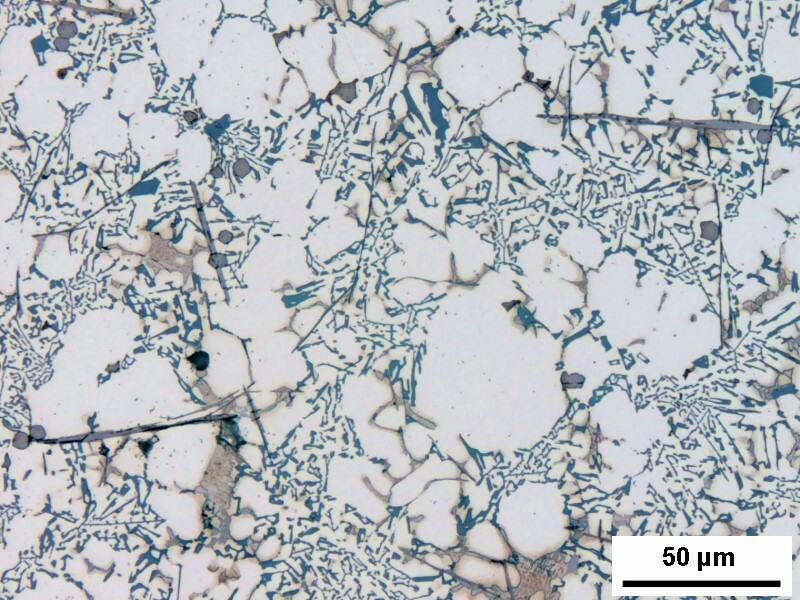 Both the oxides and the Fe phases exhibit high melting points and an increased density and are therefore prone to settle in the furnace in the form of furnace sludge due to the effect of gravity if the bath is not sufficiently agitated. For this reason, this phenomenon is also often referred to as “gravitational segregation” or “gravity segregation”. According to eq. 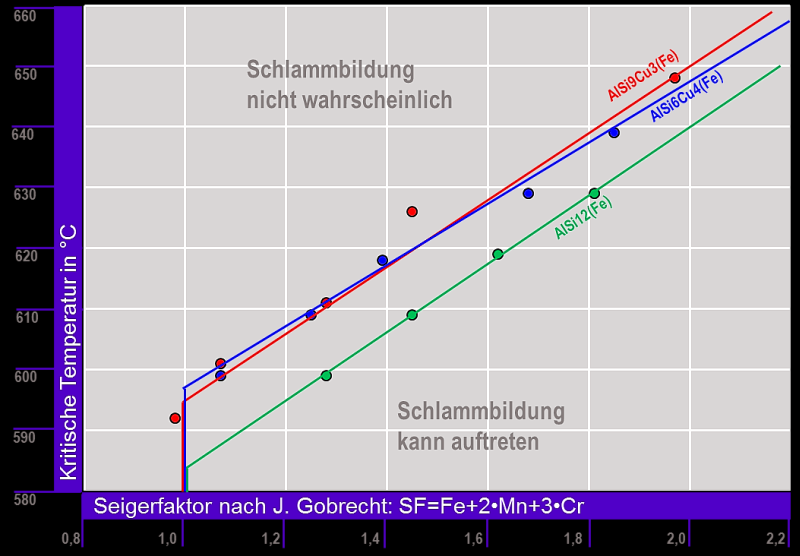 2, gravitational segregation could therefore also take place above a holding temperature of 680°C with an iron content of Fe = 1%, whereas it only forms below 600°C pursuant to Gobrecht and Jorstadt. 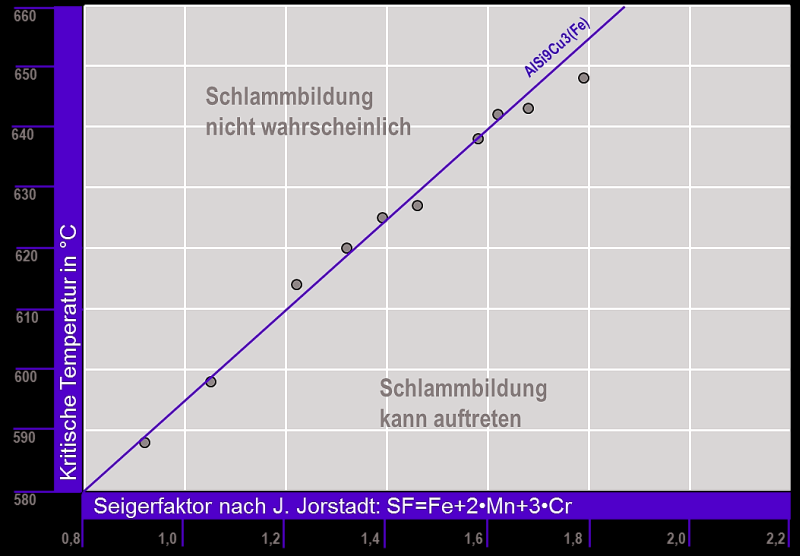 Even though the segregation factor according to Gobrecht and Jorstadt is widely used and accepted, eq. 3 is sometimes also applied and is given here for the sake of completeness. M. M. Makhlouf M., D. Apelian, Casting Characteristics of Aluminium Die Casting Alloys, Final Report DOE/ID–131716 prepared for US Department of Energy, 2002. 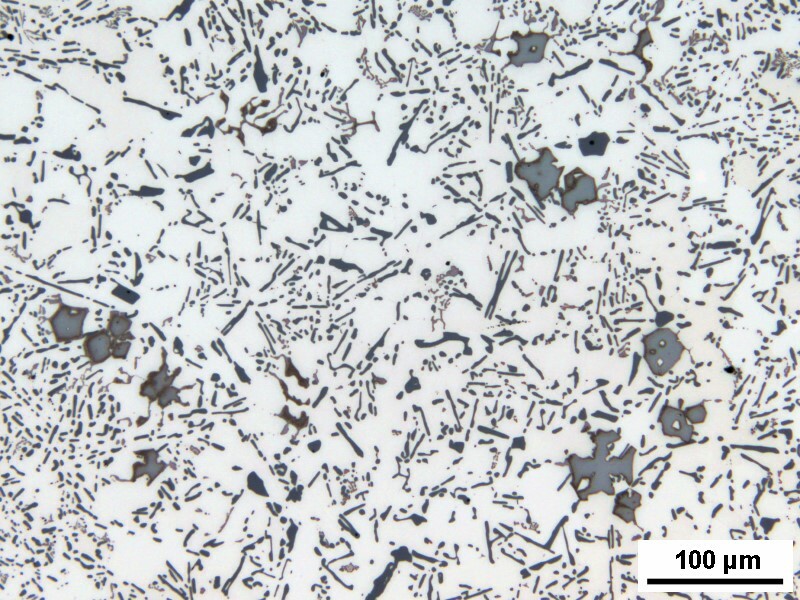 M. M. Makhlouf, D. Apelian, and L. Wang, Microstructure and Properties of Aluminum Die Casting Alloys, NADCA, 1999. J. L. Jarstad, “Understanding Sludge”, Proceedings of 14th SDCE International Die Casting Congress and Exposition, Toronto, Ontario, Canada, May 11-14, 1987, Paper No. G-T87-011. J. Gobrecht, “Schwerkraftseigerung von Eisen, Mangan und Chrom in Aluminiuim-Silizium-Legierungen”, Teil 1, Gießerei, Vol. 61, no. 10, 1975, p. 263-265. 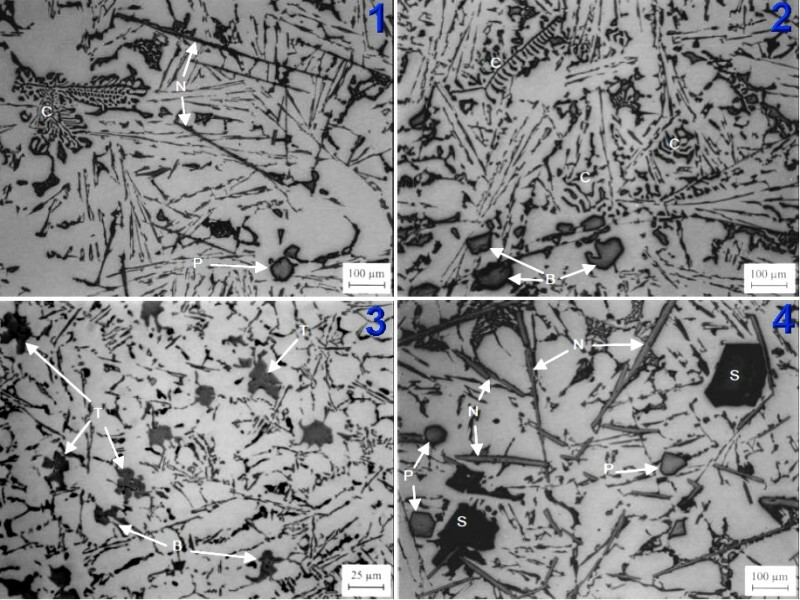 S. G. Shabestari, and J. E. Druzleski, “The Effect of Solidification Condition and Chemistry on the Formation and Morphology of Complex Intermetallic Compounds in Aluminum-Silicon Alloys”, Cast Metals, Vol. 6, No. 4, 1994, pp 217-224.